An option is an agreement to buy or sell an asset at a fixed price on or before a given future date. An option is thus a contract between a writer and a taker. The underlying asset is a share in a company traded in the stock market, but there are options over other types of assets (e.g. currency commodities and bonds). An option is similar to an insurance policy. The writer (seller) of an option receives money – the premium – to take on the risk that the price of the underlying share finishes above or below a certain price on a specified future date. 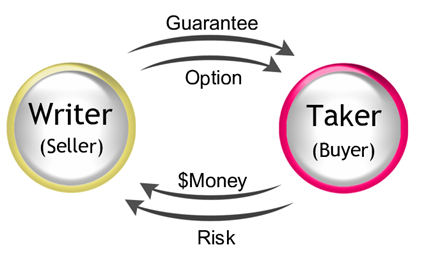 The taker (buyer) pays the premium to be assured of a fixed price for a transaction in that share on that future date. All options have an expiry date and therefore perish with time. There are two types of options: call options and put options. Options markets are use to speculate on price direction , hedge portfolios and forward purchase shares.